(21 November 2018) The School of Hotel and Tourism Management (SHTM) at The Hong Kong Polytechnic University (PolyU), the School of Tourism Management of the Sun Yet-Sen University (SYSU) in Guangzhou, and the Institute for Tourism Studies (IFT) in Macau, signed a Memorandum of Understanding (MOU) today for establishing the Greater Bay Area Tourism Research Alliance (the Alliance). The five-year tripartite collaboration aims for strengthening the international tourism status of the Guangdong-Hong Kong-Macau Greater Bay Area (GBA) through joint endeavour in tourism research. The set-up of the Alliance is to develop the GBA into an international first-class bay area ideal for living, working and travelling through leveraging the comparative advantages of Hong Kong, Guangdong and Macau. The MOU was signed by Professor Haiyan Song, SHTM Associate Dean and Chair Professor and Mr and Mrs Chan Chak Fu Professor in International Tourism; Professor Honggang Xu, Dean of School of Tourism Management of the SYSU; and Dr Fanny Vong, President of the IFT. Professor Timothy W. Tong, PolyU President, and Professor Jun Luo, SYSU President, witnessed the signing at the ceremony held at the SHTM. Under the Alliance, the three institutions will collaborate in the annual production of the Report for Tourism in the GBA. They will conduct a series of research activities over the next five years with significant impact at local and international levels, and will contribute to the development of public infrastructure, tourism attractions and services in the GBA. The three institutions will also provide mutual support in liaising with governmental units and tourism industry partners of their respective regions to collect data and information for conducting collaborative research in tracking the tourists’ satisfaction and the quality of accommodation in the GBA. It is expected that these co-operative endeavours will provide the respective governments with meaningful insights and scientific references so as to facilitate them in policy-making for tourism development. “The School of Tourism Management of Sun Yat-Sen University, the SHTM and IFT are long standing partners in research and student exchange programmes, and together we have achieved significant results. The establishment of the Alliance will provide an organisational system to strengthen and deepen the co-operation amongst the three leading institutions. The School of Tourism Management of the SYSU is committed to delivering the agreement and will join hands with the other two partners to achieve the visions and goals set out by the Alliance,” said Professor Xu. 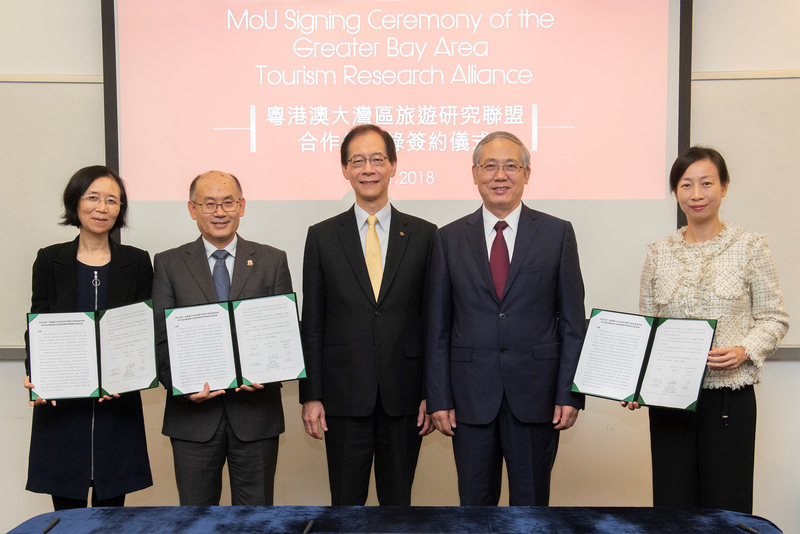 “The MOU signed today will further consolidate the relationship amongst the three institutions, which will jointly build a research platform and think tank to provide intellectual support for tourism development in the Greater Bay Area. By scientifically examining the existing challenges and exploring future trends, the Alliance will contribute to regional integration of tourism and establish destination branding for the GBA in the long run,” said Dr Vong at the ceremony. Professor Timothy W. Tong, PolyU President (Back row, left), and Professor Jun Luo, President of the Sun Yet-Sen University (Back row, right) witnessed the signing of the MOU by: (front row from left) Professor Honggang Xu of the Sun Yet-Sen University, Professor Haiyan Song of PolyU and Dr Fanny Vong of the Institute for Tourism Studies.